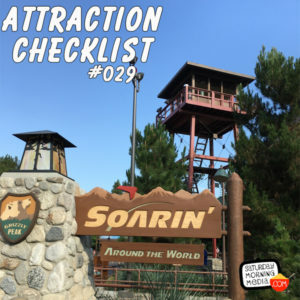 http://www.attractionchecklist.com – This episode we resist the Soarin’ attraction after it’s refresh to Soarin’ Around The World. John B. deHaas is back with my in Disney California Adventure as we ride and review this updated attraction. Recorded on June 21, 2016. This episode we revisit an attraction we’ve experienced before that got a bit of a refresh. We are headed to Disney California Adventure to ride Soarin’ Around the World. The Guidemap describes Soarin’ Around The World by saying; Soar and swoop over famous landmarks. Guests must be 40” or taller to experience this attraction and the thrill level describes the ride as being Loud, Dark, Slow and having Small Drops. FastPasses are available for this attraction. Before we buckle up for take off, here are five fast facts about Soarin’ Around The World. 1. Soarin’ Around The World at Disney California Adventure is an updated version of the classic Soarin’ over California attraction. A new film was introduced at Disney California Adventure on June 17, 2016. 2. The updated version of the film matches the films at both Shanghai Disneyland and Epcot at Walt Disney World however each movie has a different finale scene where you soar over the respective parks that the attraction is in. The Disney California Adventure version features a flyover of Sleeping Beauty’s Castle at Disneyland, while while the Shanghai version features a flyover Shanghai and the EPCOT version features a pass by Spaceship Earth. 3. The new film features a brand new score by Emmy winner Bruce Broughton, but it has elements of the original attraction’s score that had music by Jerry Goldsmith. The score was recorded by the London Studio Orchestra at the legendary Abbey Road Studios in London. 4. Locations visited on the update attraction now feature landmarks such as the Great Wall of China, the Eiffel Tower and The Great Pyramids in Egypt. 5. The smells on the attraction have been updated as well. Now the smells of grass in Africa, the ocean of the South Pacific and roses of the Taj Mahal fill your nose as you soar above the various landmarks. Along for the ride today is my friend John B. deHaas and you will hear our review of the updated attraction moments after we stepped off of it for the first time. This is a binaural recording so if you have headphones, put them on now as we experience Disney California Adventure’s Soarin’ Around The World.